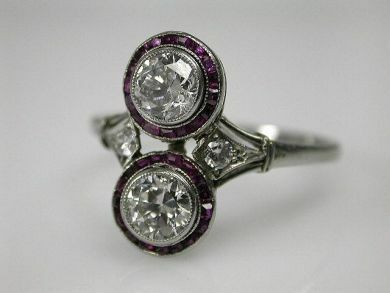 One custom-made platinum art deco ring. Two old European cut diamonds (0.72 carats: VS clarity: G-H colour). Two old european cut diamonds (0.08 carats: VS clarity: G-H colour). Thirty-four tapered baguette synthetic and natural rubies (0.40 carats).